20:36:30 Jenny Brandon: Greetings fellow early birds! Any worms? 20:36:55 amusepro: Is there sound too? 20:37:14 Jenny Brandon: Not yet, I don't think. 20:47:07 Jenny Brandon: So, anyone know if the Yankees won? 20:51:22 Paul Allison: Welcome all. 20:56:19 Jenny Brandon: sound yet? 20:59:36 SusanEttenheim: hi everyone! welcome! 21:00:43 SusanEttenheim: hi everyone! can you hear ok? 21:01:04 aram: I can hear clearly. 21:01:12 Jenny Brandon: Susan, I'm having buffering issues tonight, i.e., I've heard 2 words so far. 21:01:47 SusanEttenheim: hi byran thanks! 21:04:39 carolteach4: I was very impressed with the show last week and with Troy - looking forward to learning more this week. 21:04:51 SusanEttenheim: yes, me too! 21:05:20 SusanEttenheim: hi ann and matthew welcome! 21:05:37 SusanEttenheim: would everyone please introduce yourself - where and what do you teach? 21:06:20 brcranda: Bryan Ripley Crandall - Ph. D student in English Education at Syracuse University. Taught 10 + years in Louisville, Kentucky. 21:06:26 SusanEttenheim: ah hi matthew! have we met? 21:06:35 Paul Allison: One of my ongoing frustrations is when my principal doesn't seem to "get" that students when they post in a "forum" on the school site aren't writing formal essays. 21:07:10 Paul Allison: We could make a cheer! 21:07:39 Ann Chappel: I'm an elementary teacher. 21:08:08 brcranda: I was just on (Bryan) but the audio streaming keeps going out. It sounds good now! 21:08:47 Dawn Reed: hello everyone! It sounds like we have a lot of excited teachers here tonight :) I am Dawn Reed from Michigan. I teach high school in mid-Michigan. 21:09:41 Paul Allison: I think about mode and media all the time. Like put this on line fast ... and revise this... so much is "socially accepted" distinctions - like we just accept different kinds of language in different places. Or is it measured by the media? 21:09:41 SusanEttenheim: amusepro... welcome - did you introduce yourself? 21:09:42 joelmalley: is there a link to this map? 21:09:53 SusanEttenheim: welcome joel and leslie! where and what do you teach? 21:10:03 SusanEttenheim: hi hollyanna welcome! 21:10:12 SusanEttenheim: paul - url for map?? 21:10:24 HollyannaBates: who is talking right now? 21:10:25 leslie d: Hi, I teach Spanish in Colorado. 21:10:30 joelmalley: I teach Mass Media/Film Production, English 10, and AP Literature...I was on but it seems if I switch to a different tab I get logged out. 21:10:43 brcranda: This sounds like Collin Brooke's thinking on 21st Century Rhetoric. 21:13:28 brcranda: Congratulations to Troy for this publication. I'm reading about it online now. 21:15:24 brcranda: Troy, do you know of any podcasts of student written radio scripts? I'm thinking about the ol' radio shows, but here students write the script. 21:15:37 Paul Allison: I wonder how we can push these folks tonight... like where's the controversey here? 21:15:42 brcranda: podcast theater, in a way. 21:15:46 Jenny Brandon, the sequal: Really not hearing much. 21:16:16 SusanEttenheim: welcome dan! welcome back joel! 21:16:19 PeggyG: of course Paul!! how does this help students pass the annual tests??? 21:16:24 SusanEttenheim: dan where and what do you teach? 21:16:35 Jenny Brandon, the sequal: I'm seeing lots of log outs and in. Is that helping the sound issue? 21:16:38 joelmalley: Thanks...I'm rocking the floating window now. 21:16:40 Paul Allison: That's good Peggy. 21:17:17 Paul Allison: And access to computers and things on the internet that you need -- how do these wonderful teachers deal with these hurdles? 21:17:20 brcranda: Howdy Ho, Troy! 21:17:25 PeggyG: that's good too Susan! 21:17:56 PeggyG: great idea to make it an exit project! 21:17:56 brcranda: a multimedia exit project! That is way cool. Keep talking. 21:19:05 brcranda: How does the Bath teacher (missed her name) implement her multimedia project? How does she work the research in? 21:19:17 aram: Sustained Silent Reading with Real Simple Syndication....?! 21:19:35 PeggyG: Paul is so humble! 21:20:55 smurchie: I'm the Bath teacher, and in a nutshell, students have to research a global issue that will affect their future. They create a nultimedia presentation with soundtrack and video, complete with MLA citations, and then show them to the entire senior class (and hopefully community members) on their last few days of school. 21:20:59 Paul Allison: I love Troy's question about podcasting around mode and media. Okay, so we have a podcast -- what's the mode? 21:21:06 PeggyG: that link didn't work-could you post it again? 21:22:00 Troy Hicks: suggestions anyone? 21:22:01 PeggyG: do you always require a written script before they podcast? 21:22:50 brcranda: Newsweek used to have a phenomenal personal essay each week called MY TURN. It was like This I Believe but with more variety. I was thinking today that it would be great for more audio essays of this variety...where students can take "Their Turn" to address what's on their mind. This sounds like a job for Paul. 21:22:59 leslie d: How did you record and then post them? Garageband? 21:24:01 Paul Allison: Listing to Dawn about her podcasting project again. It was in a speech class, and modeled on an NPR show. Her work is so beautifully produced. On the other end I'm interested in keeping a place open for a sloppy, conversational medium too. 21:24:21 joelmalley: the mute while typing only goes for those who are being broadcast, right? 21:24:25 brcranda: SMURCHIE (BATH), Do you have a research paper that is submitted (assessed) with the media project? 21:24:58 smurchie: To answer brcranda, no, there is no paper submitted. 21:25:02 PeggyG: never a problem joel! that's how we all learn! 21:25:19 Troy Hicks: Good question, Joel. Thanks for joining us tonight for your first webcast! 21:25:22 smurchie: The research statistics and questions they ask are all included in their presentation "video". 21:25:46 PeggyG: I love the stress on the writing of the script--much more than preparing a storyboard! 21:26:14 PeggyG: @Joel--I can definitely relate to information overload!! 21:26:41 PeggyG: students really take pride in their work when they have a wider audience!! 21:27:22 brcranda: SMURCHIE, If you go audio again, I look forward to hearing about how the multimedia projects operate in all their glory. 21:27:36 smurchie: will do. I think I"m up after Aram. 21:27:48 PeggyG: great example!! students really care about the quality of their work! 21:28:33 Dan Woods: my "Teaching Comp" students are preparing teaching podcasts this week. 21:28:40 demacisaac: can students add sounds or is it too hard? 21:29:48 brcranda: I tried to teach myself GarageBand for making a podcast. I gave up and did it in IMovie. The project was called, "What does Visual Literacy Sound Like?" I wanted to play with how podcasts are "visual" even if we only hear them. I failed. I needed to add visuals and make it a digital story. 21:29:55 PeggyG: great idea Joel!! videos of their essays! are they posted anywhere we can see them? 21:31:01 Paul Allison: I like both. 21:31:13 PeggyG: @brcranda--you're really making me think! does audio only make us use more description language?? 21:31:21 Sara Beauchamp-Hicks: Hello all! 21:31:29 Troy Hicks: Hmm... Bryan, sounds like an interesting "failure" in that sense. 21:31:38 Paul Allison: But what podcasting has brought us is something different than radio too. 21:31:44 PeggyG: descriptive language...can't type!! 21:31:49 Troy Hicks: What would the purpose be for labeling it primarily as a podcast and not a digital story? 21:31:59 PeggyG: love that Dawn!! 21:32:04 Troy Hicks: What are the differences between the modes and media? 21:32:16 PeggyG: spontaneous audio recording--wonderful learning opportunities! 21:32:26 PeggyG: thank you Joel!!!! 21:32:29 Ann Chappel: what kind of digital voice recorders did Renee use? Anyone know? 21:33:08 Dawn Reed: Wow! I love the This I Believe videos! 21:33:18 SusanEttenheim: hi techtalker - welcome! where and what do you teach? 21:33:27 PeggyG: me too!! what a powerful way to communicate something that means a lot to them! 21:33:40 SusanEttenheim: funny I'm having trouble with the link too! We'll have it to you soon thought! 21:33:54 PeggyG: I use an Olympus digital audio recorder and love it! 21:34:14 brcranda: Here's the truth about my visual/audio thinking. I was doing a workshop and a woman in the audience discussed her issues with students. She taught at the school of the blind and said they write with senses other than sight. I think this is remarkable and something writing teachers must always consider. It is why I love this podcast and podcasts in general. 21:34:36 PeggyG: great story brcranda! 21:36:34 brcranda: In my classroom, I often brought all my ties and made my students write (and move on a walk throughout our school) blindfolded. The goal: sensory rich language beyond our EYE CANDY world. 21:36:54 Ann Chappel: Peggy, where did you purchase your Olympus digital audio recorder? 21:38:02 PeggyG: my recorder has a usb tab so I can plug it right into my computer to download the audio. 21:38:21 Ann Chappel: Peggy, that it awesome. 21:39:26 PeggyG: @brcanda-I love that example of the blindfolded students--my daughter did that one night for dinner with her kids and it was quite an eye-opening experience for all of us! 21:40:01 brcranda: Working with a group of refugees recently, we used a recorder, plugged it into ITunes and then edited their stories. Graduate students helped them edit and produced audio stories and printed text. The teachers used these to teach younger students because the stories of adolescents in the area was inspirational to younger refugee kids at the elementary schools. It was pretty remarkable. 21:40:04 carolteach4: I had to speak to a student this afternoon working on a health project on vitamins - included a movie he created in his basic PowerPoint presentation - had nothing to do with the content. I hated to discourage him, but I had to point out that, as cool as it was, it had nothing to do with the topics of his reseach project. 21:40:57 brcranda: Oif! I need to edit my chat-grammar! 21:41:01 PeggyG: you are all sharing such awesome examples!! thank you! 21:41:35 PeggyG: @carolteach4-painful but important learning experience for your student! 21:42:39 PeggyG: @aram-your class wiki is fantastic! 21:43:58 carolteach4: I encouraged him to continue with his video creation skills but to come after school to computer club to play - the technology techniques he used were cool, but the content was both irrelevant and inappropriate in places. 21:44:38 Troy Hicks: Yes, Paul, I think tht this is a very good example of the "situation" for the writers and the writing. 21:44:44 brcranda: Is this two months in an English class? 21:45:00 brcranda: wow. Large Group, en masse! 21:45:02 PeggyG: it's always a challenge to keep students engaged after the testing is over!! this is a brilliant way to do it! 21:45:30 carolteach4: Ooh! That's scarey - having to pass to graduate. I do hope you have lots of support for those who don't pass the first time. 21:45:36 Troy Hicks: Sharon clearly has pedagogical goals by putting students in this particular writing situation -- both to help them be civic minded and to engage with the technology and compose digital writing. 21:45:48 brcranda: How big's the senior class? 21:46:04 Troy Hicks: Bryan -- yes, last two months of senior year. 21:46:39 Troy Hicks: Not sure how big her class is... she will have to address that. I can tell you that it is a rural school. 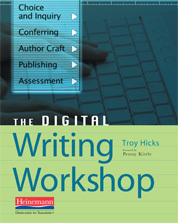 21:46:59 Troy Hicks: Author's craft and mentor texts! 21:47:11 Troy Hicks: Ralph Fletcher would be very proud of us! 21:47:13 PeggyG: this project gave them an authentic task for their creation!! 21:47:18 brcranda: A lot of these approaches remind me of Wigginton's FOXFIRE approach. Give the "Givens" and let teh students find their way to their product. 21:47:52 Troy Hicks: But... point being that showing students model texts will help them see the possibilities for composing their own texts, both in print and non-print media. 21:48:25 Troy Hicks: Sharon is making the MAPS of each model very explicit to students, helping them see how the authors crafted their compositions. 21:49:03 brcranda: Awesome! You, Yes You! Stay Quiet. Let the presentation stand! Nice. 21:49:06 Troy Hicks: Yeah, Sharon! 21:49:43 Ann Chappel: I've checked out "Did You Know..." before and agree that the multiple versions create a different visual effect and meaning. 21:50:25 PeggyG: great idea Paul! 21:50:48 brcranda: good question, Paul. 21:51:31 PeggyG: put the focus on being a good digital citizen rather than plagiarism! 21:52:17 brcranda: One question I have is if we encourage students to also cite the pictures they use that are easily grabbed from a basic google search. Photos, too, are art and the artists deserve credit. No? 21:52:37 demacisaac: are student projects getting global feedback? 21:52:38 carolteach4: Many of us teachers have gotten sloppy about citation. We have to get back to impressing on our students how important it is. We also need to model good citation in handouts and presentions we prepare for our students. 21:53:12 smurchie: Brcranda: They have to cite their pictures and all visuals as well. 21:53:38 PeggyG: posting online really expands their view of audience--for all ages!! 21:54:09 smurchie: Citations are so easy, now with landmark project or with easybib, that I insist on citations correctly formatted on everything. 21:54:13 Paul Allison: When we copy quotation from diigo (for example) and have links back to original sources, doesn't that change how we site work? 21:54:15 aram: thanks to everyone for all the links!!! 21:54:36 Sara Beauchamp-Hicks: Zotero is amazing...and so very useful for research. 21:56:28 brcranda: Troy: I love your Oct 7th Post. Index cards. Really? 21:56:31 PeggyG: you should be plugging your blog Troy!! 21:56:55 Sara Beauchamp-Hicks: Wallwisher is fun! 21:57:14 carolteach4: I am anxious to take a closer look at your blog, Troy.Thanks. 21:57:30 PeggyG: wallwisher is very interesting but hard for me to follow! 21:57:52 PeggyG: smiling at "slightly overwhelmed"
21:59:12 carolteach4: FYI - using Google Docs to capture some of the websites so I'll have them even before the chat gets published. I love being able to access Google docs from any computer anywhere. 21:59:23 PeggyG: you always have such fantastic guests on this show!! my library is growing with all of these outstanding books!! 21:59:48 carolteach4: Google Sites is Google's answere to the wiki - so easy to use. 22:00:35 brcranda: Good night, all. 22:00:44 PeggyG: so hard to choose just one!! 22:00:45 matthew valia: before we go, if any English teacher could help me with my master's thesis 2-question survey...http://quicklitquestion.com it would mean a lot! 22:00:55 carolteach4: We just rolled out Google Apps for Education at our school, and it's very exciting. 22:01:08 PeggyG: good for you Matthew! using your PLN to help you with your thesis! 22:01:33 Jenny Br: digital voice recorder that's mac compatible? Olympus doesn't appear to be. Suggestions? 22:02:36 Jenny Br: thanks Peggy ! 22:03:11 Dawn Reed: Thanks everyone. Great conversation. 22:03:13 carolteach4: What about using the iPhone to easily record audio???? Lots of kids have them. 22:03:29 PeggyG: wow! what an awesome conversation tonight!! I'm so energized with all of the great ideas!! 22:04:10 Troy Hicks: Thanks, Sara. 22:04:56 PeggyG: you did a fantastic job navigating everything Joel!! so glad you were here!! 22:05:03 Ann Chappel: JUst listened to last weeks podcast as well as tonight. I'm gaining a broader perspective and specific tips. Thank you all! 22:05:11 PeggyG: good night everyone! that hour just flew by!!! 22:05:13 Paul Allison: Troy, you do such a calm, collected show. 22:05:30 Troy Hicks: Thanks, Paul. 22:05:46 Troy Hicks: See you next week! 22:05:46 Sara Beauchamp-Hicks: Paul: Laughing as it was nothing but calm or collected at our house before TTT! 22:06:13 dan woods: Thanks for a great hour! 22:06:27 leslie d: Thanks for the new ideas! 22:08:18 dan woods: sara, what was the twitter address again?